The earliest memory of travelling on a train would be when I lived in Liverpool and I went by train from Mossley Hill into Liverpool Lime Street to go shopping in Liverpool with my mother. This would be about 1960 or 1961 when I was about 3 years old. I can't remember whether this would be on a steam train or a DMU - the line wasn't electrified yet. I think I may have done this trip at least twice though it is a long way back to remember. My next memory would be around 1964-1965 when we had moved across the Mersey to Ellesmere Port and I can rememeber catching a train from Ellesemere Port into Liverpool again. This time it would be to Liverpool Central, changing at Rock Ferry from a DMU onto a Merseyrail electric train. The thing I most remember is standing on the platform looking down the line towards Stanlow and seeing this tiny train in the far distance getting bigger and bigger and bigger! A classic train memory for many people I'm sure. We moved house again in 1968 - this time to Chester and lived not far from the old Upton-by-Chester station, which was replaced by the Bache station in the 1980's. I can easily remember going to Liverpool Exchange station in the summer of 1968 to meet my brother returning from a school trip in Scotland. The train was definitely steam, so it must have been quite near the end of steam. I also remember going on a day trip from Chester to London in the late 60's - the first of many down that line - and getting on a Holyhead train at Chester, pulled by a Class 40 of course, but only as far as Crewe where an electric locomotive would take over. Then in September 1969 I started going to school in Birkenhead by train, catching the 7.55 am train from Upton-by-Chester to Birkenhead Central, changing at Rock Ferry; returning on the 4.30 pm train from Rock Ferry if I was lucky. If I missed that it was a 3/4 hour wait until the next train at 5.15pm. 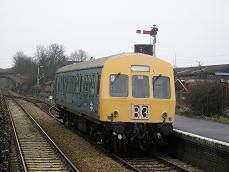 Nine times out of ten the unit would be a Metro Cammel DMU. I would do this journey six days a week, including Saturdays, though usually we finished at lunchtime, but it was still a bind having to get up early on a saturday morning to go to school. This lasted until 1976 when I finally left school, but by Christmas 1969 I had got the train spotting bug, along with several of my schoolfriends who would get on the same train as me further up the line at Bromborough.